The NetBotz 250 from APC by Schneider Electric is an affordable environmental monitoring appliance for all IT environments. It protects your computing equipment from physical threats such as high temperature, humidity, fluid damage, and both malicious and unintentional access events. With native support for NetBotz wireless sensors, the NetBotz 250 allows for a rapid deployment of your environmental monitoring solution. 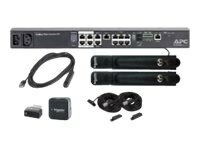 With its shallow 19" form factor, the NetBotz 250 can be mounted in a rack alongside your other IT gear, or zero-U mounted in the back. The appliance has six on-board ports for connecting various NetBotz wired sensors, including temperature, temp/humidity, smoke, and spot fluid detection sensors, as well as third party sensors via a dry contact cable. Additional dedicated ports include a beacon port, voltage output, relay output, and Modbus connections, for monitoring the device over Modbus RTU or TCP. Thresholds, alerts, and notifications are configured through either the NetBotz 250 web UI or via StruxureWare Data Center Expert. The Data Center Expert integration is especially valuable when you need to manage multiple NetBotz appliances through a single pane of glass. For environments that do not require surveillance, the NetBotz 250 is the fastest and most affordable solution to protect IT gear from physical threats.